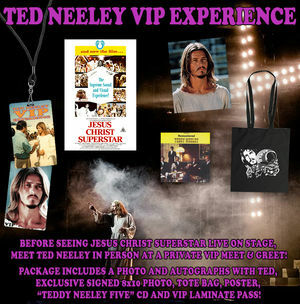 BEFORE SEEING JESUS CHRIST SUPERSTAR LIVE ON STAGE, MEET TED NEELEY IN PERSON AT A PRIVATE VIP MEET & GREET! PACKAGE INCLUDES A PHOTO AND AUTOGRAPHS WITH TED, EXCLUSIVE SIGNED 8 x 10 PHOTO, "TEDDY NEELEY FIVE" REMASTERED CD, TOTE BAG, POSTER AND VIP LAMINATE PASS. *Please note: EVERY VIP GUEST MUST HAVE A SEPARATE ADMISSION TICKET TO THE SHOW. Purchase of the VIP EXPERIENCE DOES NOT ALLOW ENTRY TO THAT NIGHTS PERFORMANCE. Friday 12th April 2019 - AFAS Live , Amsterdam , Netherlands - 5PM VIP / 8PM SHOW - SOLD OUT !! Thursday 18th April 2019 - World Forum Theatre , Den Haag , Netherlands - 5PM VIP / 8PM SHOW - CLOSED ! Sunday 26th May 2019 - Teatro De La Luz Phillips Gran Via , Madrid , Spain - 4PM VIP / 7PM SHOW - Only 3 VIP Packages Left !! All items will be received at the venue the day of the show , there is no shipping with this item and no tickets are mailed to you . You will receive meeting details via E-mail once finalized . Please place any order's for physical items separately .